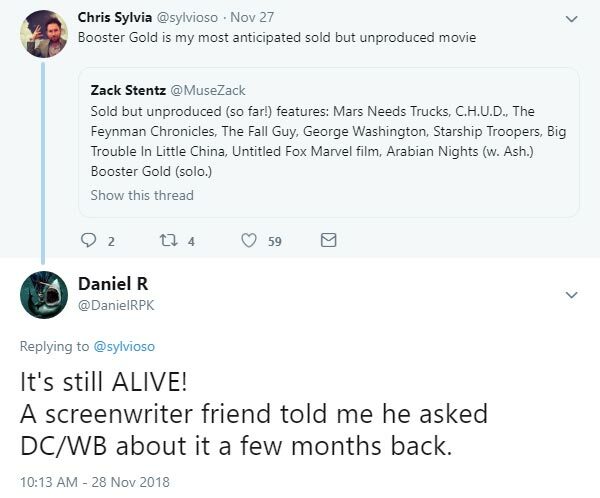 Remember the Booster Gold movie script that Zack Stentz wrote for Greg Berlanti back in 2016? Back in August, I wrote "If I were to venture a guess, I'd say it's not dead yet, just moving really, really slowly." It looks like I'm a good guesser. There you go. Booster Gold The Movie is still an "active project" at Warner Bros. Personally, I'm willing to be patient if it means they're going to do our hero right. If Booster Gold gave six news interviews and then gave ten more, how many interviews has he given in all? If Booster Gold had four costumes and Doomsday destroyed two of them, how many costumes remain? There have been 2064 blog entries since January 2010.